LeoGateway is a multi-protocols storage proxy, which supports REST-API over HTTP, Amazon S3-API1 and NFS v32. LeoGateway provides the object cache feature to handle requests efficiently and to keep the high performance of your storage system. If you want to customize settings like where to place leo_gateway.conf, what user is starting a LeoGateway process and so on, refer For Administrators / Settings / Environment Configuration for more information. watchdog.rex.is_enabled Enables or disables the rex-watchdog which monitors the memory usage of Erlangs RPC component. You can upload large objects with using the multipart upload S3-API. You can upload objects in parts. The upper limit of one part is 2 GB. LeoGateway's cache feature does not depend on the consistency level of a cluster. There is a possibility of object inconsistency. LeoGateway requests a storage node to compare a cached object's hash value with its stored object's hash value. LeoGateway selects a LeoStorage's node from RING, a distributed hash table by a target object name, then LeoGateway requests a LeoStorage node of the redundant node. If the requested object is inconsistent in the replicas and LeoGateway cached it, a client may get inconsistent objects. If you need strong consistency on a LeoFS system, you can disable the cache setting. A total number of directories to store cache files is equal to cache.cache_workers. A maximum size of a cacheable object per a directory has been determined by cache.cache_disc_capacity / cache.cache_workers. If the size of a requested object more than the maximum size, LeoGateway avoids storing the object into the disk cache. And also, when size of a requested object more than cache.cache_max_content_len, LeoGateway similarly refuses to store the object into the disk cache. Whether or not an object is cached on LeoGateway is determined by below logics. LeoGateway's cache feature is only available to small objects when cache.cache_disc_capacity = 0. 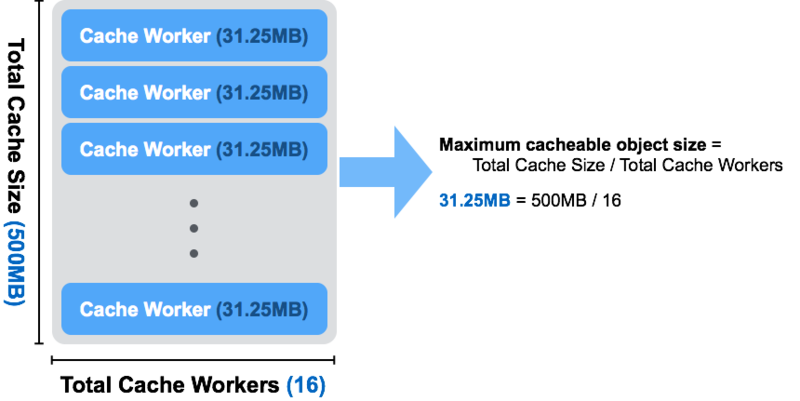 An object which size is larger than cache.cache_disc_threshold_len never be cached if cache.cache_disc_capacity = 0. How LeoGateway's cache feature works with cache related configurations is described below.